Light rail lines: 32 km. Horse-drawn steetcars: 1887 - June 1895. Streetcars: 28 Sept. 1893 - 16 Feb. 1948. Light rail: 27 Dec. 2008 - today. Airport sky train: 8 Apr. 2013 - today. The Phoenix Trolley Museum has a collection of old streetcars. Fleming, L.J. Ride a mile and smile the while: A history of the Phoenix Street Railway, 1887-1948. Phoenix: Swaine Publications, 1977. "Funding gap hits Phoenix extensions", Tramways & Urban Transit, Sept. 2009 (72: 861), p.354. 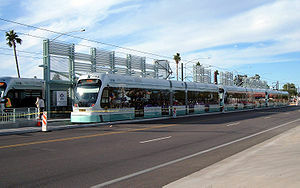 Simons, V. "Phoenix: A city rescued by light rail", Tramways & Urban Transit, March 2009 (72: 855), p.94-97. 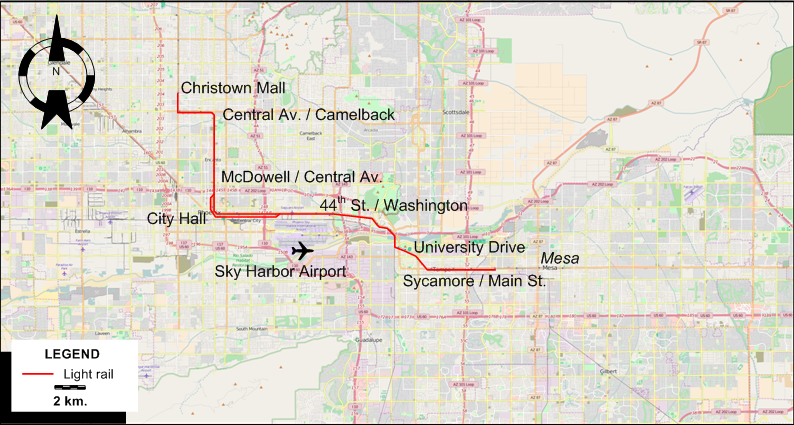 Simons, V. "Phoenix light rail takes flight again", Tramways & Urban Transit, Apr. 2017 (80: 952), p.138-142. Simons, V. "Phoenix spreads its wings", Tramways & Urban Transit, Nov. 2014 (77:923), p.94-97. "Phoenix Street Railway 1887-1948", Western Railroader, 1961 (24: 254). Special thanks to Russell Powers of Denver, Colorado for his kind help sending me information on the Phoenix streetcar network.